About chemistry: School chemistry introduces the basic concepts. To understand these, prior knowledge of some of the physical science and mathematical concepts and rules is essential. Some of the areas are easy to learn; for example, “atomic structure”, and “acids and bases”. Some are difficult; for example, “chemical equations,”“energy and enthalpy” and “oxidation and reduction”. There are some interesting areas too such as biochemistry, organic chemistry, atomic structure, which extend the understanding of chemistry and its applications. Relevance: The chemistry curriculum at school level is irrelevant and seldom applicable in everyday life. Why should one either teach or learn in such an abstract manner the manufacturing process of cement through diagrams or models or even through field visits? Why not Kitchen chemistry? 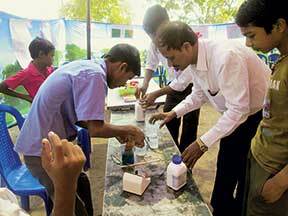 The content in analytical chemistry should aid both learners and teachers to analyze soil, food, water, etc. Relevant context-based content alone will make chemistry education more meaningful. In the classroom: All of us conduct our classroom sessions by discussing, reading out from textbooks and explaining the concepts, asking questions and dictating questions and answers related to the exercises in the textbook. This method seems be well received by the students. Peer learning methods such as group discussion, debates, participation in science fairs etc., are seldom used. On an average, laboratory work is done once in a month through content-relevant demonstration experiments. Our experience suggests that whenever we use the laboratory, there is excitement among the students. More laboratory and practical work certainly generates interest in chemistry among students and improves their learning levels. But to practice the same within 45 minutes is difficult. We fear losing control over the classroom or the laboratory as our entire attention is more focused on the safety aspect while dealing with chemicals and glassware and burners. Biochemistry is interesting but difficult: Biochemistry has many connections to the human body and health and contains some interesting topics. However it is often considered to be a broad area with high level of detail, where much text needs to be read and only a few general rules need to be followed. It is therefore both a comprehensive and abstract subject. Another problem is the modelling and the shift between macro, sub-micro and representational/symbolic levels. Chemical phenomena are often presented in textbooks at the symbolic level, and they are explained at the, unobservable, sub-micro level. Students have problems linking and relating these macro-micro-levels. The same is evident if we inquire about a student’s capacity to see structure-property-relationships in organic and biochemistry, and studying subjects related to everyday life. The working methods satisfy students: Chemistry lessons are often teacher-centered with a teacher talking or discussing topics with students. When students work on their own, they think they learn chemistry well. 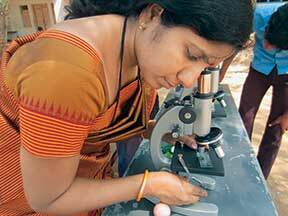 Laboratory work and demonstrations are regarded as fundamental methods of working. Laboratory work is an essential part of inquiry-based learning, and laboratory activities based on inquiry can give students opportunities to learn and develop concepts and frameworks of concepts. Students also show improved attitudes and interest in science when they are introduced to laboratory work. On the other hand, students often have problems understanding the purpose of their laboratory work and seldom use higher-level cognitive skills, since laboratory guides often follow a “cookbook” approach. All of us often wish to do more practical work, but lack of time and money is a deterrent. Everyday life makes chemistry more meaningful: The connection to everyday life is regarded as crucial in making chemistry more meaningful. For instance, context-based chemistry and scientific literacy courses like Twenty First Century Science are relevant and meaningful to make the curriculum less isolated from the students’ real world. Relevance is often used as a determinant of what is interesting to students. Relevance can be connected to personal, professional, social and personal/social spheres. We unfortunately tend to prefer abstract de-contextualized ‘pure science’ and therefore marginalize student-focused perspectives related to everyday life. We often think it is a good idea to teach chemistry from an everyday perspective, but we can give many reasons not to implement such a curriculum in our own classroom. First, we are used to specific disciplines from our own university programs during teacher education. Everyday perspectives require interdisciplinary thinking, something we rarely practice. We also assert a lack of available classroom materials but when teaching materials are available, other reasons are given. We fear losing control over the class, feel insecure about our own role in the classroom and find it difficult to assess students’ results. Dichotomy of the curriculum – science for everyone or science for the future scientist: Our day starts with chemicals. We use a lot of chemicals everyday such as soaps, shampoos, toothpaste, deodorants, shaving creams and beauty products. Our kitchen itself is a vibrant chemical lab and each ingredient is a chemical and each process in the kitchen too. Over the counter drugs and homemade remedies for common ailments, paints, food colours, colours used while playing Holi, food adulteration materials are all chemicals. Idly or dosa batter is a chemical process. For that matter, anything we come across in this universe is a chemical by default. What we mean by ‘science for everyone’ is an attempt to answer the “what’’ in the question about chemical composition of these day-to-day consumption items, their usefulness and hazardous effects and their judicious usage. These should be covered in the content of school chemistry. What we mean by ‘Science for future scientists’ is that after knowing the above facts, further inquiry, the “Why” – about the physical structure of the chemical, the composition , conducive atmosphere for chemical reaction, etc., is needed. For example turmeric in the kitchen is antiseptic, ginger is antipyretic – these constitute science for everyone, whereas “why it is so” constitutes science for the future scientist. If Cineole is the chemical which gives turmeric its antiseptic properties then what is the chemical combination of Cineole? What are its physical properties? How can one extract the same for medicinal use? Most of the content in the textbook is on these lines but is irrelevant to the context of the learner. As far as possible the science curriculum should relate to the everyday context of the learner. Having even the basic infrastructure in schools that are in remote rural areas is a big challenge. Student absenteeism poses the challenge of continuity. Missing links in the content makes classroom transaction difficult. To get rid of the fear of chemicals and processes in a laboratory is a challenge. Pooling of raw materials for science labs is difficult. To overcome our limited competencies in lab experiments. Difficulty in preparing teaching and learning material for chemistry teaching. Lack of basic knowledge in children. 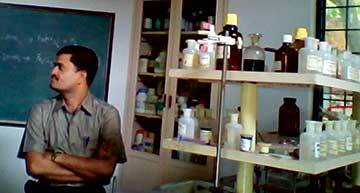 To acquire minimum requisite knowledge in designing innovative activities to teach chemistry. After a lot of debate, we were able to draw some conclusions. The role of secondary school science, especially chemistry, is often discussed from the point of view of whether it should be ‘science for everyone’ or ‘science for the future scientist’. It is essential for these to coexist since there is a need for both future scientists as well as a well-educated public. We think students, who are studying in secondary school are possible future scientists and we also think it is fundamental that chemistry at the school level be related to everyday life. We agree that chemistry is more than factual knowledge. Students need to discuss whatever they know about the subject with us so that we can ensure they can go beyond just the basic knowledge and develop an understanding of the subject. Gurubasavaraj, Govt. Boys High School, Shahapur; Zahara Begum, Adarshvidyalaya (English medium Govt. High School), Shahapur; Dinesh, Govt. High School, Moodbal village; Anil Angadaki, Azim Premji School, Yadgir; Akkamahadevi S Patil, Yadgir District Institute, Azim Premji Foundation, Yadgir. The author is with the Yadgir District Institute, Azim Premji Foundation, Yadgir. He can be reached at parimalacharya.a@azimpremjifoundation.org.